Inspired by our organic fabrics and want to use them for your collection? Designed your own concept and want to create your own fabric? Looking for a reliable supplier for your eco fashion line? We have many years of experience in the fashion industry, and specialise in manufacturing fabrics and garments from design to a finished product. With an established network of reliable partners we can ensure you the fabrics that you want with responsibly sourced material and ethical production. Always looking for innovated fabrics in your fabric store? We are looking for dedicated resellers throughout the Netherlands and Belgium. 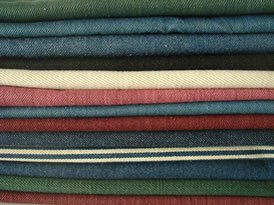 Are you looking for eco-friendly fabrics? We are looking for agents who believe in our concept and are willling to introduce sustainable fabrics into the fashion industry. Feel free to contact us anytime, so we can inspire & show you our sustainable fabrics collection. Interested? But want to learn more about our fabrics? Our qualities are eco-friendly and socially produced. Most are handspun and handwoven, some machine made.